Still looking for a great gift? The Gingher featherweight thread snips are by far one of my favorite tools. I would recommend gifting these to a sewer, of any skill level. They are lightweight and portable (they come with a cap). The snips are always in the open position and spring loaded for ease and quickness. The super fine tip enables one to get those pesky loose threads snipped closely. These buttons are handmade by Portland local Elizabeth of Ebet’s buttons. We have a nice selection of her one of a kind buttons. These would make a lovely gift for an already existing project that needs a beautiful finishing piece, or inspiration to create something wonderful. 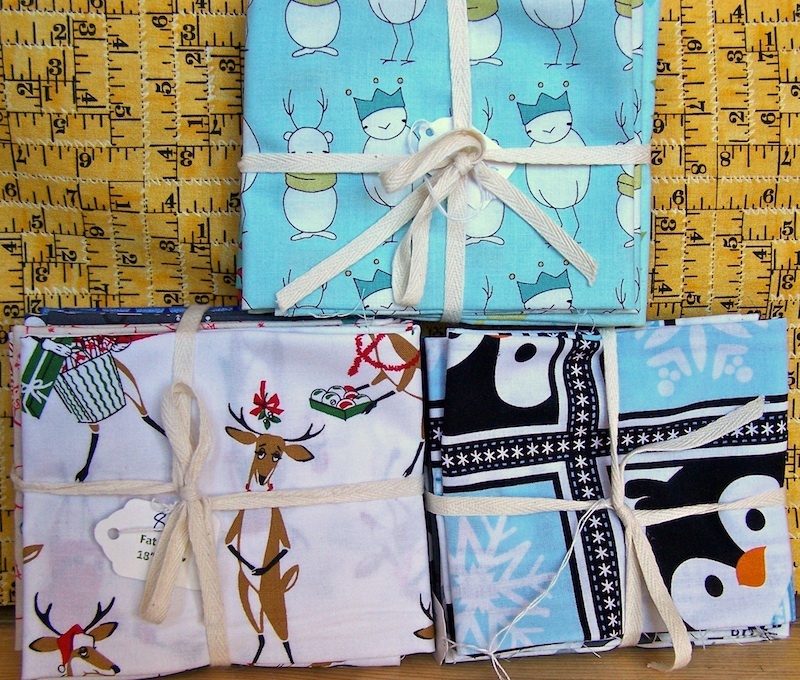 Take home some holiday and winter fat quarter packs for wrapping up gifts. If we were to reuse fabric instead of paper for the holidays (even just for a few gifts) imagine how much paper going to the landfill would be spared. Here is a post from a previous holiday season with a gift bag tutorial and other helpful tips. Recently we took part in a blog tour for the Ruby Star Wrapping Book. Check out this wonderful post by Heather on gifting with fabric.